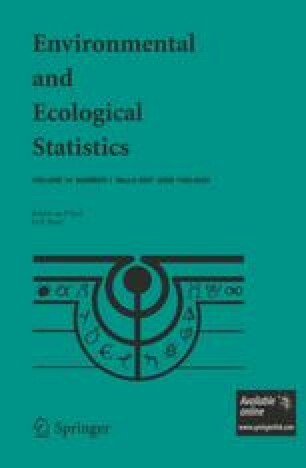 Graphical models (alternatively, Bayesian belief networks, path analysis models) are increasingly used for modeling complex ecological systems (e.g., Lee, In: Ferson S, Burgman M(eds) Quantative methods for conservation biology. Springer, Berlin Heilin Heideslperk New York, pp.127–147, 2000; Borsuk et al., J Water Res Plann Manage 129:271–282, 2003). Their implementation in this context leverages their utility in modeling interrelationships in multivariate systems, and in a Bayesian implementation, their intuitive appeal of yielding easily interpretable posterior probability estimates. However, methods for incorporating correlational structure to account for observations collected through time and/or space—features of most ecological data—have not been widely studied; Haas et al. (AI Appl 8:15–27, 1994) is one exception. In this paper, an “isomorphic” chain graph (ICG) model is introduced to account for correlation between samples by linking site-specific Bayes network models. Several results show that the ICG preserves many of the Markov properties (conditional and marginal dependencies) of the site-specific models. The ICG model is compared with a model that does not account for spatial correlation. Data from several stream networks in the Willamette River valley, Oregon (USA) are used. Significant correlation between sites within the same stream network is shown with an ICG model.